One of the world's foremost religion journalists offers an unexpected and provocative look at where the Catholic Church is headed and what the changes will mean for all of us. What will the Catholic Church be like in 100 years? Will there be a woman pope? Will dioceses throughout the United States and the rest of the world go bankrupt from years of scandal? 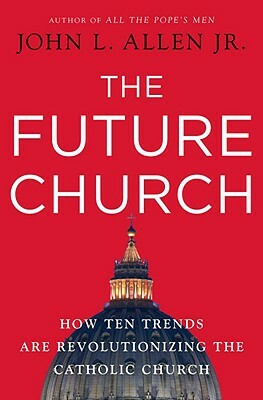 In THE FUTURE CHURCH, John L. Allen puts forth the ten trends he believes will transform the Church into the twenty-second century. From the influence of Catholics in Africa, Asia, and Latin America on doctrine and practices to the impact of multinational organizations on local and ethical standards, Allen delves into the impact of globalization on the Roman Catholic Church and argues that it must rethink fundamental issues, policies, and ways of doing business. Allen shows that over the next century, the Church will have to respond to changes within the institution itself and in the world as a whole whether it is contending with biotechnical advances including cloning and genetic enhancement the aging Catholic population, or expanding the roles of the laity. Like Thomas Friedman's The World Is Flat, THE FUTURE CHURCH establishes a new framework for meeting the challenges of a changing world. JOHN L. ALLEN, Jr., is the Vatican correspondent for the National Catholic Reporter and a Vatican analyst for CNBN and National Public Radio. He is the author of Conclave, All the Pope s Men, and Opus Dei, and writes the weekly Internet column, The Word from Rome. He lives in New York City and Rome."